← Resisting our way to irrelevance? My kids took many pre-assessments for learning. This one is for the Fantasy unit. As an elementary school teacher, this was a very good year. I helped kids successfully manage their standardized tests. Taught kids to read, write and appreciate mathematics. I taught kids the meaning of empathy. Taught kids to be proud. Taught kids to be respectful. Taught kids the importance of literature. I taught kids to celebrate when completing a writing piece. 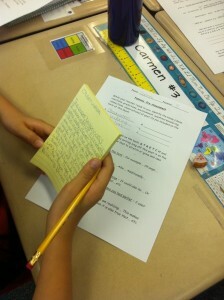 I taught kids to reflect on their learning. I helped gather evidence and write my school’s accreditation report. I was a member of the strategic planning measurement team. I coached parents on the changes to the school’s math and literacy curriculum. I coached kids to write children’s books. I coached kids to love poetry. I gave two speeches at our school’s chapel services. I taught kids to solve their problems. I mentored our incoming team leader. I received continuing professional development in literacy and educational technology. I dabbled in podcasting. I updated and designed curriculum in realistic fiction, poetry and fantasy genres. I created online tutorials for math homework. I started an online educational blog which now has over six hundred followers. I received excellent ratings from my school’s leadership during our formal evaluation process. I received many notes of thanks from colleagues, parents and students. Have a great summer, teachers. Rest up for another amazing year in 2013-2014.